Introducing Neatly -The Travel Packing Cube By AmazinGear LLC! An organizer for luggage or suitcase that save more than space, weight and time - It also gives you a Peace Of Mind! Why Choose Our Travel Organizer Cubes? ✔ 7 Total Cubes! - All great, useful sizes for all your needs! ✔ Includes a Multi-purpose pouch - For all accessories, cellphones, chargers etc! ✔ Lightweight - Won't add to luggage limits! ✔ Durable- No ripped seams or broken zippers! ✔ Mesh front - Allows breathability and visibility! ✔ Save time by finding things easily! ✔ 100% satisfaction and money back guarantee! Have you ever finished your 3 hours of packing - only to wonder if you packed enough socks? Did you reopen your luggage to look and then spend another hour fixing the mess you made? Are you at the airport with 20 minutes to catch your flight -and then hear those dreaded words- "Open your suitcase, please!" Neatly will organize your world! Stop letting the frustrations of preparing for your holiday ruin your trip. Enough on wasting time looking for stuff! With Neatly Travel Cubes, your world will be orgarnized! 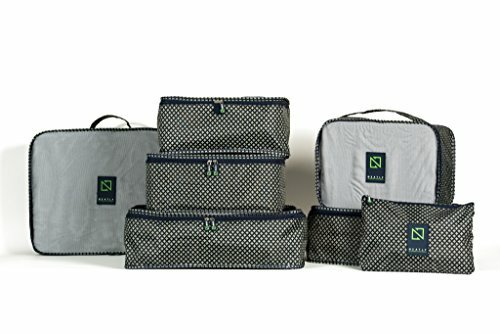 Our luggage organizer boasts 7 perfectly-sized storage bags for your packing pleasure. With 2 large, 2 medium and 2 small organizers, you will be able to store your items neatly! We also included an EXTRA multi-purpose pouch! Use it for whatever you want! Be it your cellphone, charger, power bank or toiletries. It will hold it securely in place. Use It Everywhere! Take these packing cubes with you on work trips, camping trips, long-awaited holidays or short weekend getaways. Put them in your backpack or in your suitcase. They will save you space anywhere! 7 MUST-HAVE SUITCASE ORGANIZER SIZES: Don't be fooled by sets offering multiple cubes for your clothes. Many times these "extras" are too small to truly help your packing needs. We offer 7 convenient sizes that fit together perfectly - 2 large, 2 medium, 2 small AND we give you a travel accessory pouch. Essential for all your toiletries, phones, chargers, ipods or whatever else you feel the need to put inside. A CUBE THAT FITS MORE IN YOUR LUGGAGE: Stop sitting on top of your bulging luggage, trying to zip it closed by force . Save space with our travel storage cubes. Efficiently utilize the interior space of your suitcase so you can pack in more. Even better - our travel packing cubes keep it neat. No more tediously-packed personals that shift in transit. Your clothes look the same on arrival as they did when you put them in. YOU WON'T TIP THE SCALES WHEN USING THE TRAVEL PACKING CUBE: Don't sweat costly overweight charges. Our 7-cube organizers are lightweight. This saves you those extra ounces needed to add that extra pair of shoes. But if you do go over - Don't sweat it! Simply lift one cube out and rearrange in seconds. You will love the new found confidence in putting your suitcase on the airport scale. MESH CUBE THAT PROTECTS AND ALLOWS VISIBILITY: Let your clothes breathe with our mesh front design. No more washing clothes on arrival to get out unwanted odors. Breathability is key. But mesh does more than that. You can SEE your packed items. Forget destroying your perfectly packed bags checking to see if you brought the blue shorts. Simply lift and look. Everything will stay in place and checked off the checklist. MONEY-BACK GUARANTEE ON OUR LUGGAGE ORGANIZATION SET: We are so sure that you will absolutely love our packing cube set that we are offering you a 100% refund on your money. We value our customers AND believe in our product. In this way, you can try it out risk-free! So, take advantage of an opportunity and allow yourself to fall in love with our cube organizer. If you have any questions about this product by Neatly, contact us by completing and submitting the form below. If you are looking for a specif part number, please include it with your message.